This retaining wall is on the south edge of the Seaway Transit Center property. 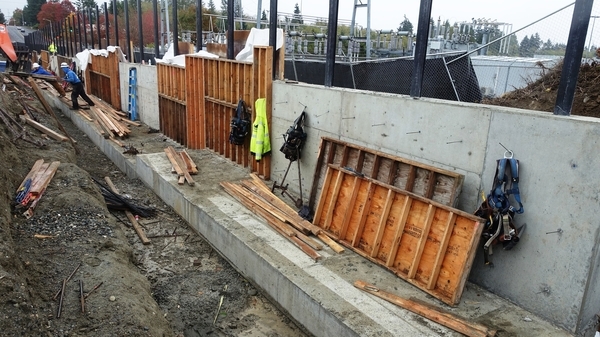 At the site of the Seaway Transit Center, work continues on a stormwater drainage system and a retaining wall. 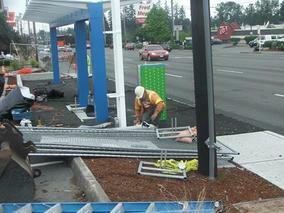 Work along the northbound lanes of Seaway Blvd. will continue for a few more weeks, installing stormwater drainage facilities, a bus pullout area and curbs. Any lane closures that are needed will occur on weekdays between 8:30 a.m. and 2 p.m. Westbound and eastbound traffic on 75th Street SW will narrow to one lane through the end of October. Closures will occur only as needed on weekdays between 7:30 a.m. and 5 p.m.
Flaggers will assist pedestrians, and the temporary bus stop on the westbound side remains open. 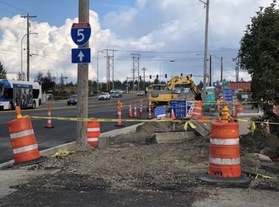 There are several weeks of construction left for the eastbound lanes of 128th St. SW just west of I-5, but things are definitely moving along with visible progress. Beginning the week of Oct. 23 and continuing for a few weeks, businesses in the area will be receiving new driveways and sidewalks and curbs will be restored. There are no definite plans for any lane closures in the coming week; the new bus-only lane should provide enough space for construction workers and their equipment. Should there be an unexpected need for more space, the current far-right eastbound lane will close for the shortest time possible, and only between the hours of 9 a.m. and 3 p.m.. Foundations for new traffic lights and signage poles will also be poured over the coming weeks, weather permitting. Information about the construction on 128th St. SW is online at www.communitytransit.org/128th. Pictured above: Businesses in the area will soon have new driveways. 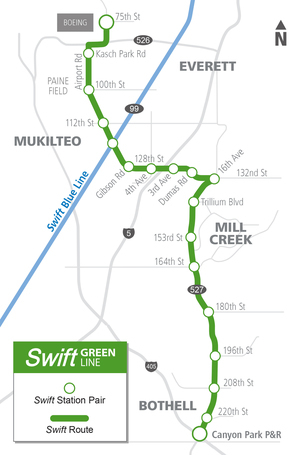 The Swift Green Line stations are in the final stages of pre-construction planning. Actual work will begin in November, starting along Airport Rd., from Hwy. 99 north. Station work will be done in several overlapping phases, including road work, platform work, traffic signal adjustments, main structure installation and amenities installation. This newsletter will have weekly updates and www.communitytransit.org/swiftstations will be updated as frequently as details change. In-person and virtual community meetings are also being scheduled. Pictured above: The Casino Road Station of Swift Blue Line under construction, August 2009.